BERRIEN COUNTY — While plenty of families completed their Christmas shopping during Black Friday and Small Business Saturday, millions more are searching for that last holiday deal online. Jennifer Tulley is one of them, having already shopped at Target in Benton Township last week. While the Benton Harbor resident has yet to take part in any Black Friday sales, she said she’ll be do the bulk of her shopping Monday online. According to a survey from the National Retail Federation about shopping intentions for 2015, about 135.8 million American consumers will have shopped Thanksgiving weekend with almost 80 percent of holiday shoppers – 183.8 million people – planning to take part in Cyber Monday. Ever since 2005, when the Monday after Black Friday was relegated to the busiest online shopping day of the year, the number of shoppers has grown due to high-speed Internet connectivity and more mobile devices such as smartphones and tablets. To Sherry Booth, of St. Joseph, Cyber Monday is a product of online retailers like Amazon, eBay and Shopify. Booth, who was doing some of her shopping in downtown St. Joseph Friday, said she won’t be buying anything online during the holiday season because she enjoys shopping locally. In the week leading up to Black Friday, Booth said she has received an average of two emails a day from Amazon notifying her of what is on sale Monday. The NRF also found an emerging way that shoppers were placing orders online. The survey showed that out of all Americans who plan to shop online, about 24.8 million – or one in five – will use a mobile device. That’s up 22 percent from last year, the NRF said. In the past few years, St. Joseph resident David Whitt said he has made online purchases on his iPhone. As an Amazon Prime member, Whitt said he regularly checks the site to see if there are any deals that piques his interest. BENTON TOWNSHIP — Michael Gagliardo was among the dozens of people waiting in lines outside of the Twin Cities’ largest retailers on Thursday. The Kalamazoo resident was at Best Buy in Benton Township, waiting for a chance to get a 55-inch flat-screen TV on sale for to hang on his living room wall. When he arrived at Best Buy at 10 a.m., Gagliardo discovered he would be the second person to receive a doorbuster ticket. Gagliardo said he drove to Benton Harbor for Thanksgiving because there were too many Western Michigan University students in Kalamazoo already stationed outside of stores as early as Wednesday. The lone person in front of Gagliardo at Best Buy was Benton Harbor resident Brendalin Lewis. She was also on the hunt for a cheaper-than-normal flat-screen TV. “I’ve been doing this for 11 years,” Lewis said beneath a tied-down tent shielding her from the ever-changing climate. In years past Lewis has shopped at Best Buy, Meijer, Target and Wal-Mart for Black Friday deals. Lewis said she chooses stores based on whomever has the best deal. Her first time lining up in anticipation for Black Friday doorbuster sales was at Meijer more than a decade ago, when she bought a skateboard for her grandson. Lewis says she doesn’t budget for presents this time of year, but always plans to keep an eye out for that one big deal that can make or break a Christmas. At Target, John Florvilus bested everyone. The Berrien Springs resident left home early and showed up in Benton Township at 6 a.m. to an empty parking lot. Florvilus said he waited another four hours until he saw someone else arrive at Fairplain Plaza. Florvilus was out looking for a 55-inch TV for his children during his first attempt at Black Friday bargain hunting. He said he thought people would be there just as early, since he had never done anything like this before. Those who showed up only a few hours beforehand weren’t as lucky. Ruth Koemes and Ron Robb, of St. Joseph, got in line at Best Buy about two hours before the doorbuster sale began and found themselves behind a line of about three dozen people. The couple is originally from Grand Rapids, where in the past they have seen lines at Best Buy wrapping around the building. “This isn’t as bad, but I think we might miss out on what we came for,” Koemes said. The two were in Benton Township to buy two large flat-screen TVs for themselves and Koemes’ son. Robb said they were made aware of the Best Buy deals through a few emails, but didn’t look elsewhere for others. BENTON TOWNSHIP — As the saying goes, the early bird gets the worm. Thanksgiving evening many birds likely will be waiting outside some of the larger area retail stores hunting for deals. Many stores have been opening their doors earlier each year in anticipation of Black Friday sales. While it had been customary to wait in long lines until stores allow people to flood in at midnight, many are choosing to instead open on Thanksgiving Day. Cindy Christians, manager of The Orchards Mall in Benton Township, said the mall be closed with the exception of the mall’s anchor stores. The mall will open at 6 a.m. on Friday, rather than its normal time of 10 a.m. The mall will then close at its normal time on Friday at 9 p.m. 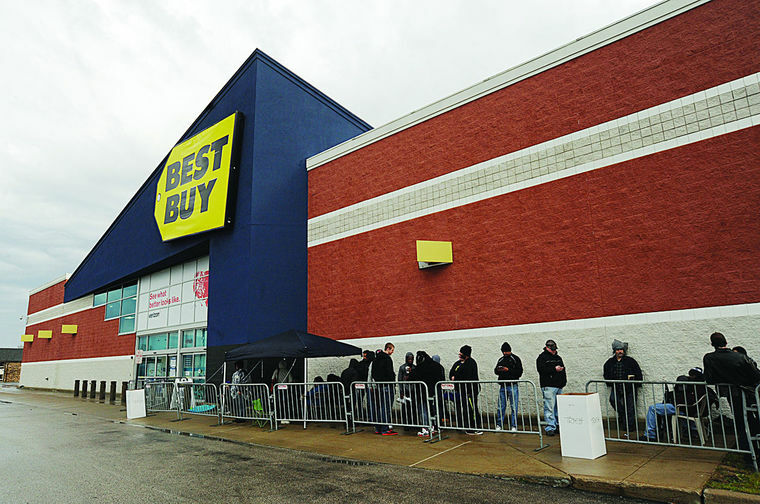 The Best Buy in Benton Township posted its hours on its website at the beginning of the week in advance for holiday shoppers. Thanksgiving shoppers can access the electronic retailer today from 5 p.m. to 1 a.m., from 8 a.m.-10 p.m. on Friday and 9 a.m.-10 p.m. on Saturday. Tickets are required for in-store Black Friday doorbuster shopping and will be handed out when people begin to line up today. According to the store’s manager, ticketing helps ensure the safety of Best Buy customers and employees when the store opens its doors. A ticket will grant customers the ability to buy an item for a limited time for the doorbuster sale. The tickets will be handed out in a two-hour time frame on a first-come, first-served basis before Best Buy opens at 5 p.m. While stores like Meijer and Walmart are open 24 hours a day, Black Friday sales don’t start until specified times during Thursday and Friday. For its doorbuster sale, the Target store at 960 Fairplain Drive in Benton Township will open at 6 p.m. today and remain open through 10 p.m. Friday. The store hours on Saturday and Sunday are 8 a.m. to 10 p.m.
Target store manager Ashley Turley said they consider this to be the best time for families to go shopping, as they also opened the same time on Thanksgiving a year ago. Doorbuster maps will be handed outside to customers waiting in line. The digital version will be available on the Target app. Turley said all store employees are scheduled to work at some time over Black Friday weekend. She also said they are there to help if a problem arises. Numerous other stores around Southwest Michigan will be open this evening and/or offering Black Friday deals. Bargain hunters can also venture to downtown St. Joseph on Friday and Saturday. Whitney Behnke, executive director of St. Joseph Today, said merchants will begin their extended holiday hours on Black Friday. In addition to special sales, shoppers can also enjoy free, horse-drawn trolley rides from noon to 3 p.m. on Friday. On Small Business Saturday, special giveaways and discounts will be available. Behnke said downtown St. Joseph is a good venue for people who seldom go shopping. For a full list of shops and Small Business Saturday specials, visit www.stjoetoday.com/shopsmall.